Holly Hardwick Crowns is proud to be the nation's leading provider of crowns and tiaras for women, men and children. In business for over 35 years, Holly Hardwick is well known worldwide, as the 'ultimate authority on crowns and tiaras', the "Queen of Crowns". She has been on major television networks, talk shows, and major publications, such as: Fox News New York, People Magazine, Wall Street Journal, Fairfield Press, Connecticut Post, Southern Lady Magazine, and Pageantry Magazine, as their fashion editor for ten years. (See "Media" to view the news articles.) Holly designs crowns and tiaras for a variety of clients in pageants, fairs, festivals, Mardi Gras krewes, Fraternal Orders, Brides, Quinceanera, celebrities, corporations, newborns, and even for religious statues. Holly specializes in custom crown and scepter creations that you can't find anywhere else. If we don't have what you looking for Holly will design it. You may fill out our "crown consultation request" and we will get back to you within 24 hours. Holly Hardwick boasts the most extensive line of crown jewelry and crown accessories on the internet! We offer exclusive lines of crown jewelry designed for some of the most important pageant systems, mardi gras krewes, festivals and fairs, also ladies fraternal orders, such as: Order of Eastern Star, Order of Amaranth, and Daughters of the Nile. We make "pageant sashes" for hundreds of pageants, such as: Miss, Mrs, Ms. and Teen International Pageants, US Continental Pageant, Mrs. Globe, America's Miss Pageant, InterContinental Pageants, Mrs. America, Mrs. United States, and America's National Teenager. "Holly's Royalty Retreat" is the only pageant training retreat of its kind, providing pageant training to those seeking a state or national title, in luxurious surroundings! You are coached by former major title holders who are experts in getting you the title you desire. 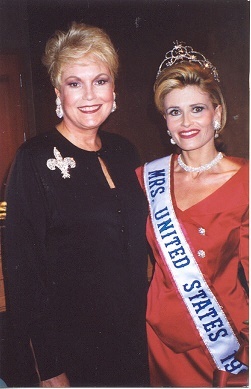 Holly herself is a former state and national title holder as "America's Perfect Lady" 1998, Ms. New York 1998, and Ms. Connecticut 1999. "Royal Title Certificates" are offered to give you an official "royal title" commemorating a birth, corporate award, graduation, birthday, charitable achievement or memorial. Each "royal title" will be published in the "title registry" which will be housed in the Library of Congress. Staying connected to our customers is a priority. We stay current on news trends in pageantry with our blog. If you have some interesting news to share, please send us an email. If you prefer interaction through Social Media, you can reach us through Twitter, LinkedIn, YouTube, or MySpace. We're also available through Facebook. "Like us" to get in on our contests! Subscribe to our Newsletter for exclusive member only sales! Or just call 800-684-1107 or Send Mail. Inquiries are welcome! Our friendly and knowledgeable staff is dedicated to making your shopping experience with Holly Hardwick Crowns an enjoyable one. We will not only assist you in selecting the perfect crown, tiara or accessory for your event, but go out of our way to make sure that your order arrives on time and in perfect condition. * Expert commentary, background and story ideas on the topics of crowns, tiaras and pageantry. * A list of other experts and contact information on the topics of crowns, tiaras and pageantry. * Written articles, columns, tip sheets, and other short items on the topics of crowns, tiaras and pageantry.